Eat What's Weirder: This Martha Stewart-Ai Weiwei Selfie OR "Oprah Selfies"? What's Weirder: This Martha Stewart-Ai Weiwei Selfie OR "Oprah Selfies"? 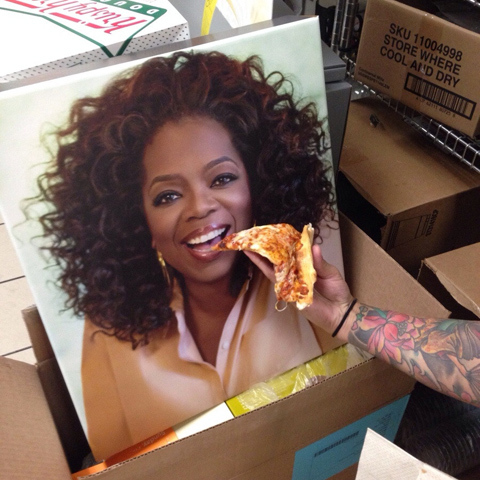 Today is the day of unexpectedly awesome and weird celebrity food selfies. We love selfies. Especially when they are bizarre, and involve food celebrities and/or celebs in general. And today is a great day for the celebrity selfie. 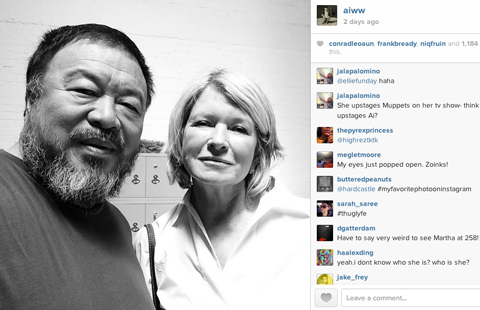 First, Martha Stewart took an Instagram-selfie with Ai Weiwei. Apparently, Stewart was in China this past weekend trying to convince Chinese women to take up baking (the geniuses over at Shanghaiist have already come up with the phrase “cupcake diplomacy.”) During her travels, Stewart snapped the obligatory selfie with the contemporary artist. Then there are the bizarre Oprah selfies below that Starbucks workers have been posting all over the Internets. The arrival of posters bearing Winfrey’s face at Starbucks stores led to the weird and wonderful selfies. The posters celebrate the “Handcrafted Teavana Oprah Chai Tea Latte” that just launched at Starbucks and Teavana stores around the country. So we ask you: What’s weirder, the Martha Stewart Ai Weiwei selfie, or the Oprah Selfies below?